The biggest civic monument to be built in the USA since 1936 was officially opened in Atlanta on 4th July 2008. Dedicated to 2000 years of peaceful accomplishment, the inauguration ceremony was conducted by a line-up of local and national figures from public life including the Bishop of Atlanta and Congressman John Lewis. Mr Lewis, a friend and colleague of Martin Luther King (who was himself a citizen of Atlanta), declared the site “a place of peace.” The National Monuments Foundation turned to British architect Hugh Petter to create a unifying design for the 70 ft high classical monument which is taller than London’s Wellington Arch. 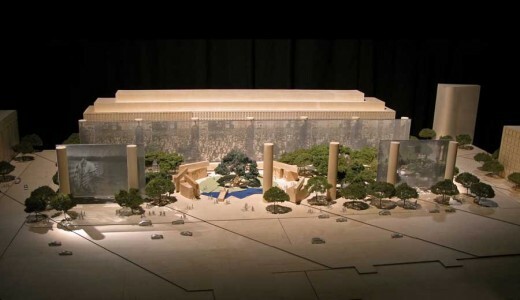 Eisenhower Memorial Design, Washington, D.C. The Statue closed in October 2011 to undergo upgrades to visitor safety and accessibility. It reopened on October 28, 2012, the 126th anniversary of its original dedication, and then closed again the next day due to the Superstorm. The storm was not the first major challenge faced by the contractor on this project. In 2004, the contractor performed the initial life safety upgrades necessary to re-open the Monument after the events of 9/11. The Weight of Sacrifice Memorial, Pershing Park, Washington, D.C. 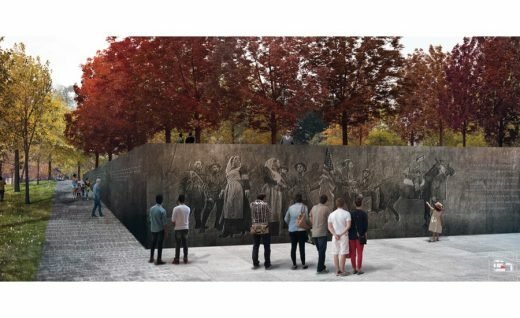 The site for the memorial is Pershing Park, a triangle on Pennsylvania Avenue just two blocks from the White House.